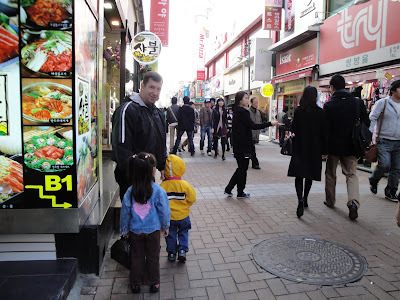 These photos were taken when we drove to Daegu last weekend. We stopped at Camp Walker army base first and then we took a taxi out into town to one of their major shopping districts. 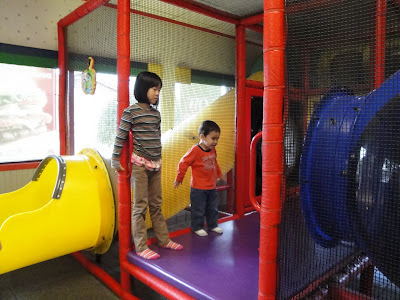 While at Camp Walker, we had lunch at Burger King and let the kids play for a while. We had a great time watching the kids play. EJ was very fond of the Korean girl in this pic. After playing with her for a little while, he introduced himself to the girl's mother and then brought her out of the play area to our table so that she could meet his parents. I laughed and told Rose that, even at a young age, EJ understands respectful customs. 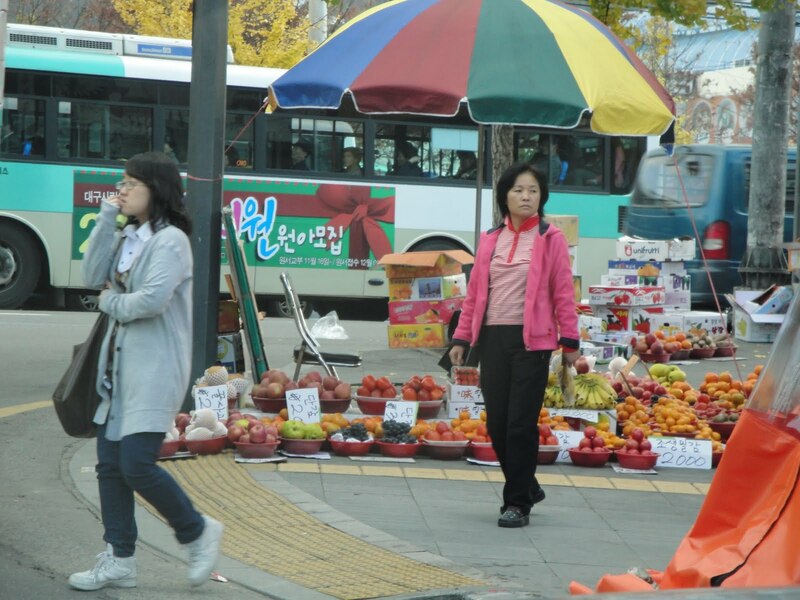 The Koreans seem to have fresh produce available all year long, even when it is bitter cold outside. 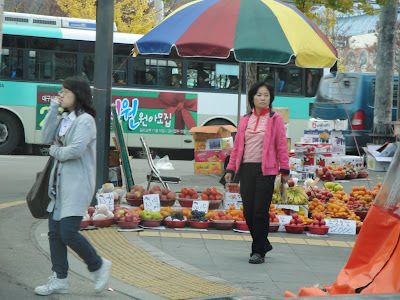 Here is a pic of a street produce store located on a busy corner. The Academy shopping area in Daegu. The wind was really ripping through this street and we often took shelter inside the warmth of the small stores. 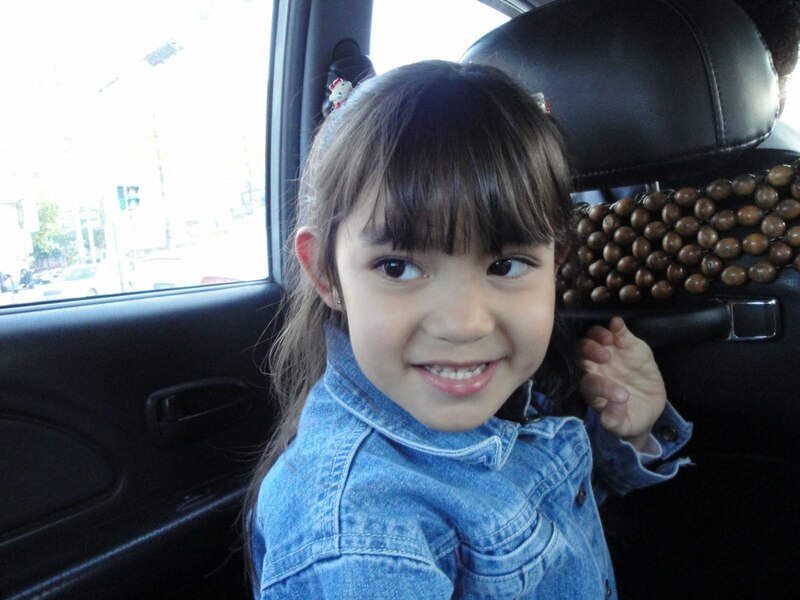 Rylie during the taxi ride out into Daegu. Pic of mommy teasing the little ones in the back seat. 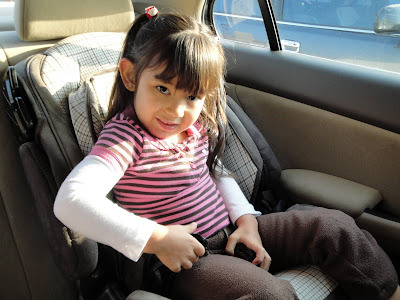 Rylie getting ready to lock herself into her carseat. 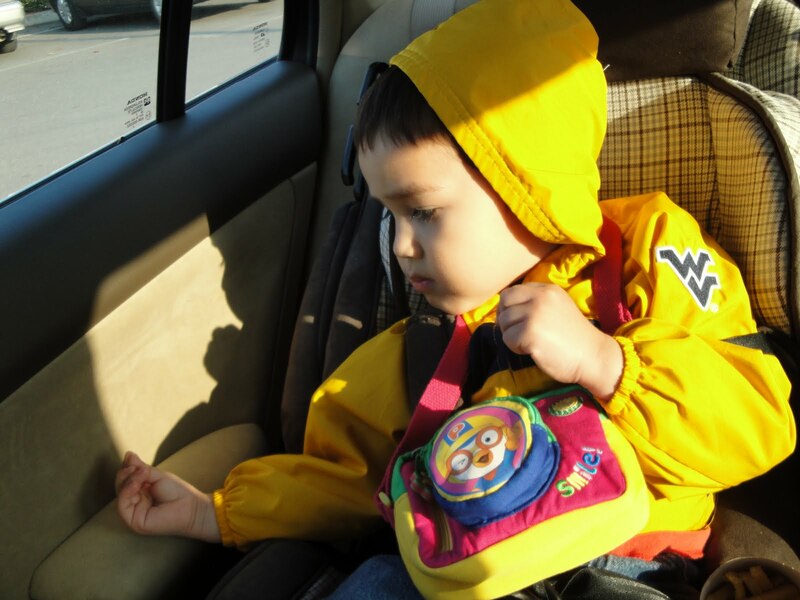 EJ was really into this bag. The minute he saw it in the store, he began asking for it. It was pricey so Rose tried to convince him to take one of the many other bags but he held firm to this particular bag. I told her to give up and get him this bag. I knew he would never be happy with another. I read from my friend's facebook update that they had snow last week. Don't u think it's too early for snow these days over there? Happy weekend John and thanks for playing this week. The shopping area everywhere in the world is maybe the most interesting part of the city for women :):) Have a great day! Hi John, I am surprised with EJ, after knowing him thru your posts that he is a shy little kid, hehehe (only camera shy). Both you and Rose are great parents and his respects take it from you. I bet the shopping is fun in their area! Its getting cold here now in the West Coast, just mid 50's in the early morning! You really have a wonderful family John. You seem to be blessed with life's true treasures such as family love, wonderful job, fantastic bonding moments. Though there maybe some problems along the way, remember to focus on your blessings especially your wonderful family and you will always be grateful to God for His goodness to you. Thanks for the feel good post. God bless you always. Such an adorable family you have! Congratulations on Rylie's winning the smile contest! oh, by the way, Efren Penaflorida Jr is CNN Hero of the Year, thanks for the support too! time for Pinoy Pride again! Another fun weekend with the family. Btw, congratulations to your little angel. EJ might follow dad's footsteps, to marry an Asian girl in the future. lol! That's what I want for my boys as well. Awww, cute kids! And I think we have the same car seat! I enjoy viewing those beautiful places you go to. Didn't know you're a good barber. Thanks for sharing these pics, John!